Are you planning to host any spring party this season? Why not?! With the beautiful weather and fresh beginning that comes with spring, there are plenty reasons for you to celebrate with loved ones! If you are having an outdoor party this spring, be ready to you greet your guests on your outdoor living area with a big smile and a clean home! Whenever you are hosting an outdoor event, it is important to create a visual separation between the outdoor dining and living spaces by using area rugs. You would want to choose colours that belong on the same palette as to keep the overall look of your outdoor area cohesive but not too similar. 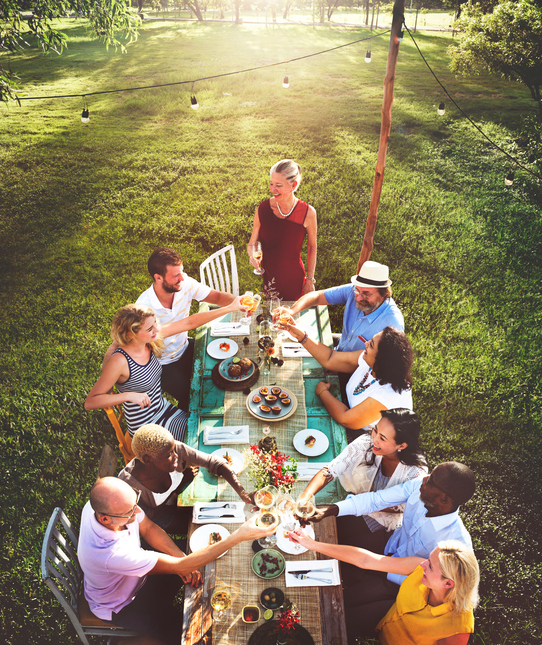 If you live near other homes, you can still host an outdoor party but you must remember: privacy is essential. You might not notice it right away but freestanding planters help a lot in adding seclusion to any outdoor living space. You can also use drapes or curtains to add another level of privacy to your outdoor area. Spring is all about fresh flowers so this season makes it the perfect time for you to experiment with different centerpieces – you can even try making your very own! Just remember that when mixing different species, such as roses, tulips, forsythia and dianthus, you should stick with a solid colour scheme in order to prevent the overall look of your centerpiece from becoming busy. Do not underestimate the power of the menu. If you are planning a casual afternoon, you can go for a picnic style. Finger sandwiches, bowls of freshly cut fruit and colourful salad will do the trick. You can also fire up the barbecue and seduce your guests with the aroma or ribs and pasta. If you want a sit-down dinner, then you would want to serve chicken or fish. Don’t forget that sweet treats always come in handy – baked cookies and doughnuts are always crowd pleasers. As for refreshments, do not forget cool drinks for the kids such as smoothies or freshly squeezed fruit juices and you may also serve wine for the vino drinkers. When hosting an outdoor party, make sure that there are enough seats for all your guests. You do not want your guests having to go home because they do not feel comfortable enough. Invest in stackable chairs that can easily be assembled during outdoor events. This entry was posted in Real Estate Tips and tagged outdoor party ideas, spring outdoor party. Bookmark the permalink.